Supplementary material reads: "Chernus -- Harbor. Captions. Cardinal McIntyre. Two negs. 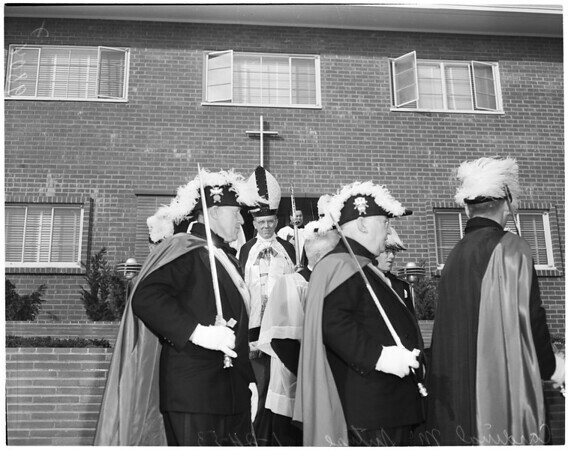 show James Francis Cardinal McIntyre, marching between rows of members of San Pedro Knights of Columbus during Mary Star of the Sea High School dedication. One neg. shows Cardinal McIntyre, flanked by priests blessing room and crucifix in new Mary Star of the Sea High School. One neg. shows Cardinal McIntyre blessing entrances to first unit of high school. Other negs. show Cardinal McIntyre flanked by church dignitaries marching to the scene of dedication."